Grab yours masks and beads…It’s BARDI GRAS on February 28th! Mark your calendars and prepare to style yourself as a Shakespearean character, a famous New Orleanian, or a provocative mash-up of your own design. Masks are optional… and just a little decadent. Welcome to the night you have been longing for. 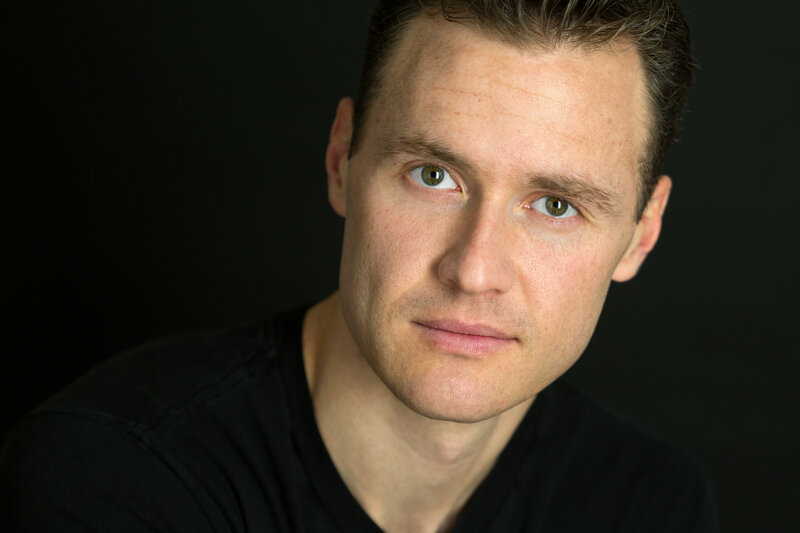 Artistic Director Tim Errickson sat down with Amanda Jones (Imogen) and Brian Robert Burns (Posthumus) to talk about their roles in Boomerang’s current production of Shakespeare’s CYMBELINE, directed by Boomerang Associate Artistic Director Cailín Heffernan. 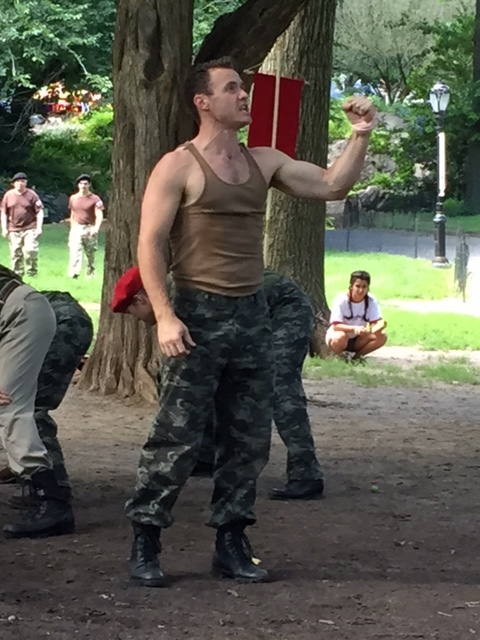 CYMBELINE runs thru July 19th in Central Park. Tim Errickson: Hi guys! We’ll start with Amanda…Amanda, you’ve worked with Cailin a few times now. How did you guys meet? 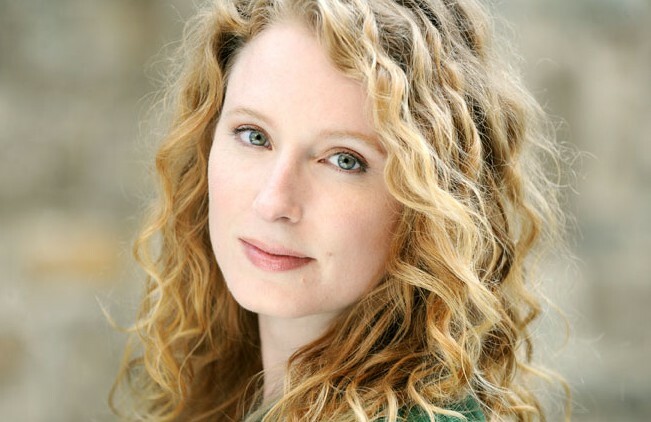 TE: And then you also appeared in Love’s Labour’s Lost for us last summer that Cailin directed. AJ: That’s right! She emailed me late one night to ask if I would be interested in replacing someone who had dropped out. I said yes right away. TE: Had you worked together between LLL and Color of Flesh? AJ: She’d called me in to audition…But otherwise, no. She just has an amazing memory. TE: Brian, you had just finished up the National Tour of War Horse before this, right? BRB: It always kinda feels* like we just got back from tour. A lot of the memories and experiences are still so fresh, and a lot of the cast has stayed in pretty frequent touch. However, we got back in late August and I think auditions were in… April? TE: Something like that, I think. How long were you on tour? BRB: Over two years. 800+ performances, 70+ cities. I’m very fortunate. TE: That’s incredible. Let’s talk about Cymbeline. For both of you, what’s been your favorite thing about working on this play? AJ: Can I say more than one thing? AJ: First, Imogen is a wonderful character. One of my professors in college just loved her, and he got me loving her, too. She’s been on my list since then. She’s such a badass, not passive, but funny and tough. TE: Someone said this is your dream role, right? AJ: It is. One of them, anyways. There’s a list, but it isn’t long. And second, working with Brian. And everyone else. Boomerang finds amazing people, so committed and dedicated and talented. BRB: I discovered how satisfying it is to do Shakespeare outside. When you’re in a box, you fill the box as best you can, you hit the back wall, etc. When you’re outside, literally, the sky is the limit. When you look out, it’s into the horizon. When you look up, you look up into infinity and you can fill it with all you can muster. It’s limitless. Also, this is just a tremendous group. I’m very fortunate to be working with such talented generous people. TE: Had either of you seen the show or worked on Cymbeline before this production? AJ: I saw the Lincoln Center production with Martha Plimpton. BRB: No- it’s so epic I always wondered how someone would pull it off. I had worked on a scene here and there, but I was always Pisanio or Iachimo. TE: It’s a large play, to be sure, and I think that’s why it isn’t done as much and one of the reasons we are excited about doing it. BRB: Except for this year! 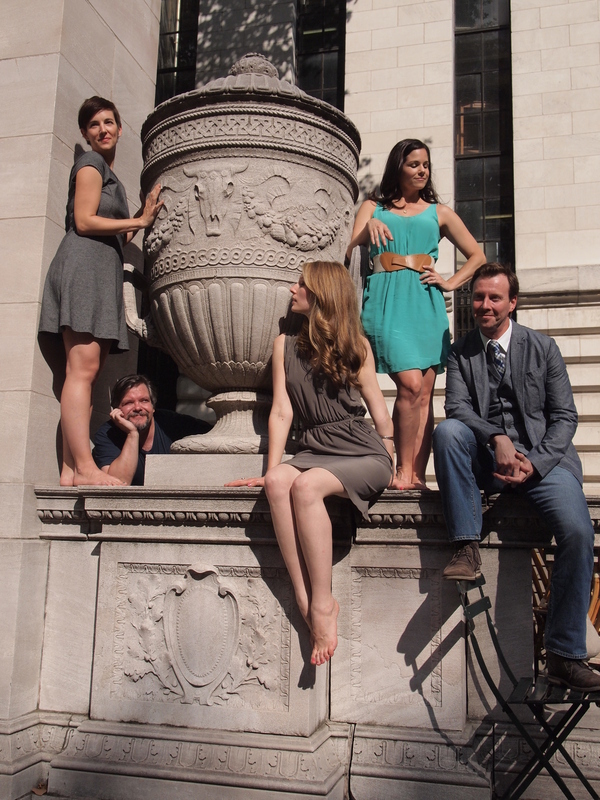 its crazy– Cymbeline is everywhere! AJ: I know. I’m very glad we’re not overlapping with a certain other production, to escape any comparisons to a certain other Imogen. BRB: I agree. This one is solely ours. TE: We’ll fare just fine in any comparison. TE: In the play, you two play lovers who are separated right away. How do you approach playing a relationship that’s fully in motion right from the start? Rather than playing people who meet and fall, which has already happened for your characters when we meet them in the first scene. AJ:It’s crazy right? We have like ten lines to establish a relationship. And less than that to reconcile at the end. BRB:In a way it’s nice to not have to show how we are with each other. And with Amanda it’s so easy. AJ: The feeling is mutual. I think the chemistry we have certainly helps. And we were able to establish some back story during table work. BRB: At that point when we first see them, love is easy and exciting. I feel the nature of their relationship in this play, the passion etc, comes from our behavior when we’re away from each other. That can be just as telling about the relationship as it is about the individual. How you represent your relationship to others when your partner isn’t around is quite revealing. Imogen makes Posthumus better than he is. And we see that by the way he bumbles around without her, creating fires. AJ: I think the thing I loved discovering most – because lots of people said things like, “Why does Imogen stay with that jerk?” – is that Imogen is as quick to believe that Posthumus has betrayed her with another woman when it comes up. She gets past it more quickly, but she also has Pisanio backing her up. BRB: Yes- proximity is, in itself, a form of security. And they’ve never been away from each other! It’s terrifying! AJ: Right! I think there are a few examples of couples in Shakespeare who think they are Epic and Their Love Is Like No Other (as all young lovers do). And it’s wonderfully dramatic (and funny) to see them thrown off balance when they realize things are more complicated than that. TE: In addition to being separated right away, you both have a lot of singing and dancing to do in the show. BRB: And, for my part, falling apparently! TE: Had either of you sung or danced much in previous shows? AJ:A bit. I did more musicals in high school and college, but I’ve always loved to dance. TE: Brian how about you? You also have a lot of guitar playing in the show. BRB: Not so much. There was only one show that i can think of. Similar to this one, it incorporated a lot of music, dance, and fight choreography. A lot of dance, a lot of capoeira. It was pretty cool. I enjoy it, but I rarely get the opportunity to do it. There was some community singing in War Horse too, but not any dancing. I don’t really think I’ve played guitar in a show before… this might be the first! And, man playing in a fifteen person band in public is awesome!!! AJ: I’m so in awe of the multiple-threats in this show. Cailin really makes the most of everything everyone can do. BRB: The amount of talent is staggering. BRB: The way Michael (Russink) and Roger (Lipson) and Hannah (Hartmann) make their transitions so seamlessly and effortlessly is incredible. 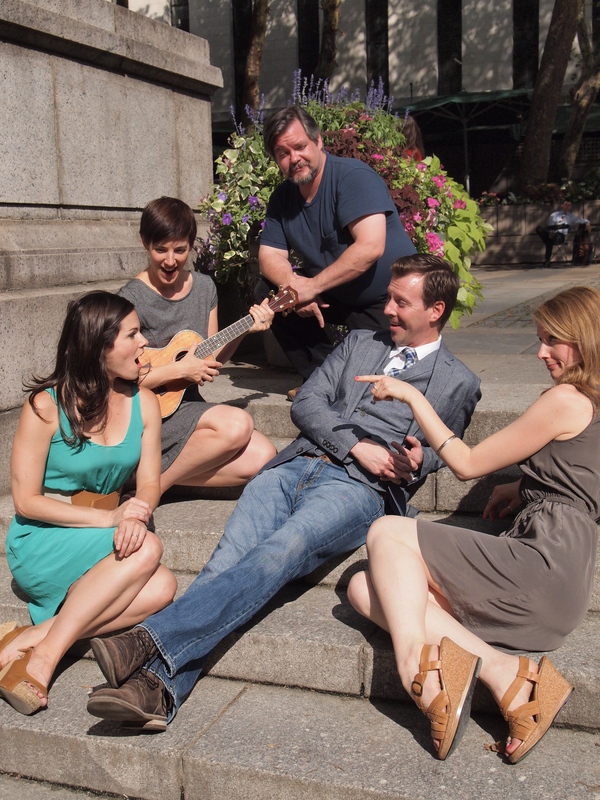 TE: Alright, last question….When you aren’t performing in Cymbeline, what are some of your favorite summertime NYC activities? AJ: Midsummer Night’s Swing at Lincoln Center: So sweaty, so worth it. Movies, to cool off. Getting an ice cream and walk all the way east or west to the riverside in the evening to catch a breeze. TE: I had no idea you trained MMA, Brian. That’s incredible. AJ: He told me I have “heavy hands” (Edit: an MMA term to describe someone who punches very hard) when we were learning our fights. I was so proud! BRB: Better to hang on to you with, lady! I’ve been a fight sports fan all my life and finally this year I decided to fit a mouth piece and get after it. I love it. TE: Have you had any bouts? BRB: Actually, I’m just starting to learn. Building a foundation. I think by the end of the year, I’ll enter an in-house tournament. But right now, I’m just learning basics and technique. Hitting pads and such. Plus, my mother would kill me if I ever actually fought! 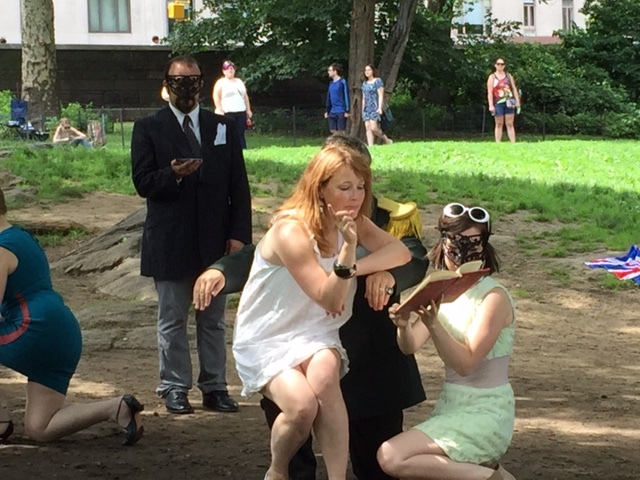 Cymbeline runs July 11th, 12th, 18th and 19th at 2pm in Central Park (enter at 72nd and Central Park West) Additional details can be found here. Cymbeline is free, no tickets or reservations are required. Donate today for a chance to win Broadway tickets! 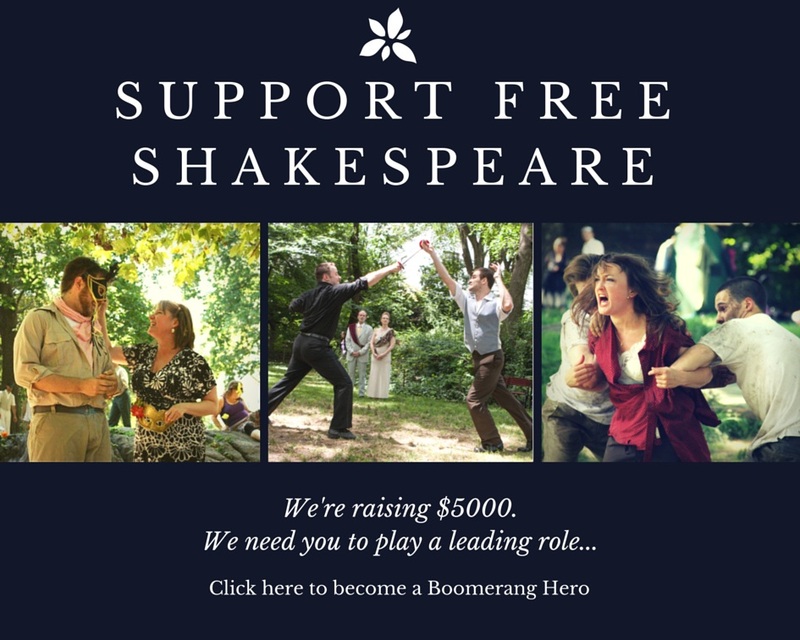 We are moving closer to our goal of 200 donations of $25 to support our Outdoor Shakespeare program. Thanks so much to those who have already donated! 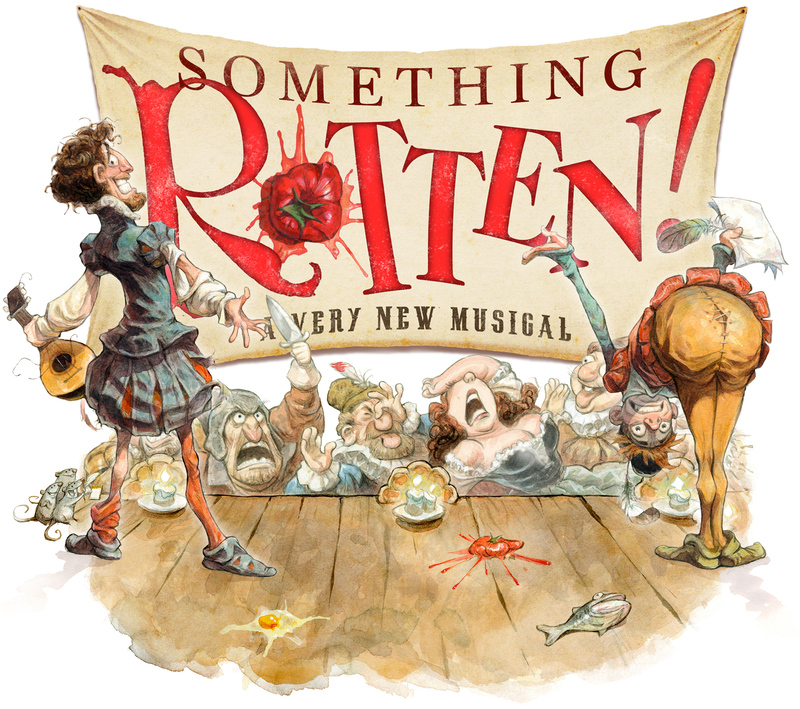 As an incentive today…each $25 credit card donation before 6pm today is entered for a chance to win two tickets to see SOMETHING ROTTEN! on Broadway at the St. James Theater this Spring! Every donation in increments of $25 is another chance to win ($25 gets you one chance, $50 gets you two chances and so on…). The opportunity to win two Broadway show tickets for $25? You can’t beat that anywhere in town! Remember this only lasts until 6pm today. 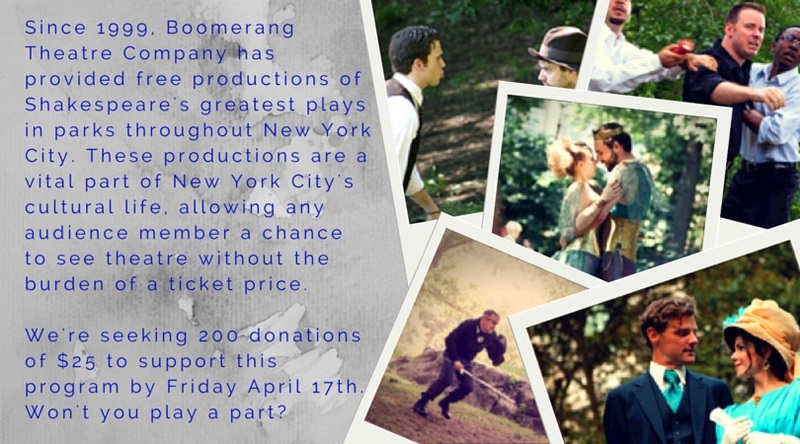 Please donate to support our production and enter to win! And click below to share with friends!